This almost when HORRIBLY HORRIBLY wrong! I have been telling myself for WEEKS that today's appointment was at 10:30 am. I arranged for my mum to mind the kids, Hubby arranged to go into work late, I planned the route to the hospital and contingency plans for if/when we couldn't get parked at the hospital. All was going according to plan! Until we had done a tour of the hospital car park and (unsurprisingly) failed to find a parking space. I drop off to the over-flow car park in town and Hubby says "It is 10:30, your appointment, isn't it?" and I answered with full confidence and swagger and referred him to the letter in my Green Notes. Which he looked at. And read 10:00. 5 MINS TIME AND WE'RE STUCK IN TRAFFIC WITH A 10 MINS WALK FROM THE CAR PARK IF WE FIND A SPACE THERE! Luckily the letter has a phone number on, I chuck my phone at him and ask that he rings them, lets them know we ARE on our way, and the traffic starts to move. No one answers but he can leave a message, by the time he has I'm pulling in to the overflow car park. I chuck my money at him, grab my notes and say "you pay, I'll go, catch me up!" and charge off at a surprising pace for a girl as fat AND pregnant as me. I arrive only 5 mins late! They were understanding when I explained at the Women's Unit. I think they must be used to people having problems getting parked there. It wasn't long after Hubby joined me that we were called. We had the same sonographer as at our dating scan, she remembered us (which is lovely) and she explained that we would be getting the long, detailed scan today and that we were no to worry if she was quiet to start with, she would be concentrating while she looked at all the stuff she needed to see. She would talk us through stuff after. Bean had other ideas though! Little monkey was well head down and not wanting to play, plus cross legged so there was no clear view of the private parts! After a new minutes of prodding and poking, and tilting the bed back in the hope of sliding baby further up my body, we were asked to go for a walk for 20 mins or so and a drink, then come back for another try. Which we did.... a little under half an hour later and I'm back on the bed getting prodded again. This time she could get Bean's head and leg measurements, but baby was STILL not for showing us the goods! Hubby was asked to leave (as he doesn't want to know before the birth) so she could try to get a better look and she thinks she may have got a flash of something.... but couldn't be sure. Now, I know the sonographers will NEVER say 100% if a baby is a boy or a girl, but I've always had "I'm fairly sure" or "pretty certain" with my other babies. This time she was not committing to anything even as much as that. 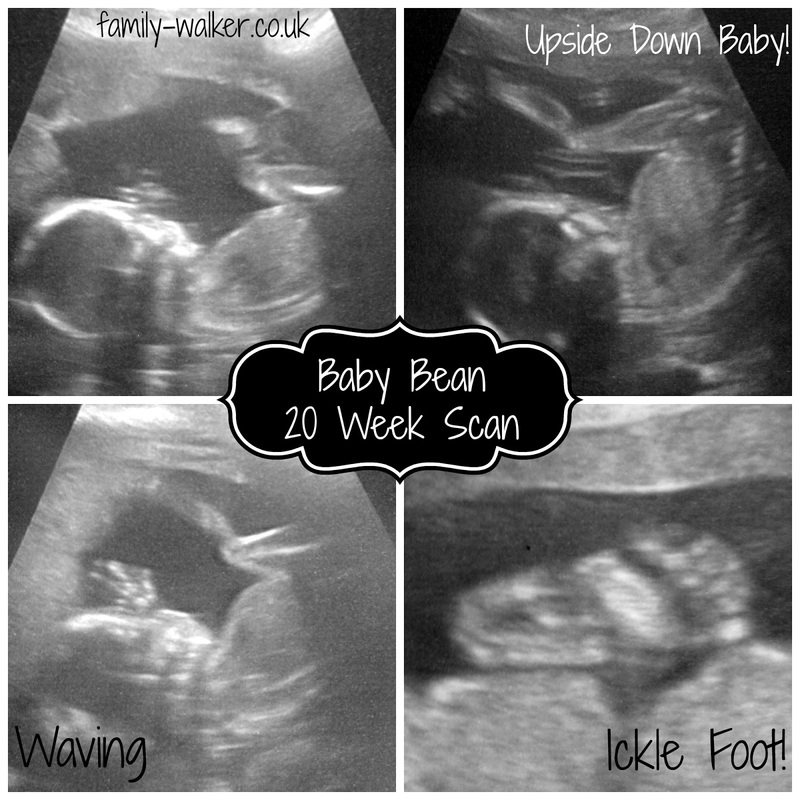 I'm to ask again at my growth scan (which is around 28 weeks). But I think she's right...... Would you like to know what she thinks she might have seen? Highlight between these brackets if you do! BUT DO NOT MENTION IT ANYWHERE! Hubby really really wants the surprise, and he deserves to have it.